Be energised and inspired on this trip of a lifetime with Azulfit's vibrant and caring teachers.Enjoy flowing vinyasa practice, gentle restorative sessions and rejuvenating meditation. This rejuvenating retreat programme combines Vinyasa Yoga and Restorative Yoga & Meditation to take you on an incredible journey of wellbeing and discovery in stunning Santorini. Immerse yourself deeply into a week of Jivamukti & restorative yoga blended with evening practices of yoga nidra, gentle flow, mantra & meditation. From your arrival in Greece you can feel at ease and enjoy the wonders of this glistening jewel of an island, safe in the experienced hands of the Azulfit team. We look forward to welcoming you, supporting you and guiding you through this incredible wellbeing experience. Through the practice of yoga and meditation you will connect with your body, mind and soul. You will work with amazing instructors through a challenging and fun program that will leave you feeling truly rejuvenated and cleansed. Drawing from the magical energy of Santorini you will feel connected with yourself and inspired. It will be the experience of a lifetime, with a chance to immerse yourself in the life-changing practice to connect with your teachers this relaxed and tranquil retreat setting. As well as the expert teachings you will also find yourself rebalanced by the beautiful nature of Santorini, with inspiring walks and views all around. Take in the stillness, soak up the Greek sunshine and enjoy the energy of this special island, allowing yourself the time and space to invite relaxation and wellbeing in. For those of you that know Andrea you will know her energy and passion for yoga are infectious. Fully certified in Jivamukti Yoga, Ashtanga Yoga and Yoga Therapy (800 hours) she is a highly experienced an inspirational teacher. Andrea is the founder of OneYoga Studio in Manchester and a regular contributor to ‘Ask The Expert’ (Manchester Evening News). She combines her many years of experience studying and working with the human body and movement with an in-depth study of nutrition and raw foods and their impact on overall wellbeing. She is also trained in ante- and post-natal care. She joins the Azulfit team with her natural and empathetic teaching style and infectious enthusiasm. Her holistic and sophisticated approach of total body, mind and spirit integration is as accessible to those new to yoga as it is challenging for the more practiced yogi. Naturally approachable and caring, her passion is to bring the joy and release of yoga to her students. 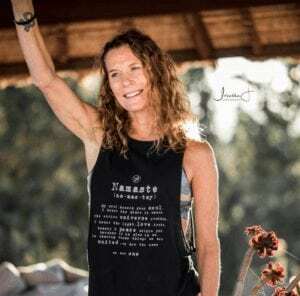 Her captivating, warm and energetic approach continues to attract a strong following of committed yogis both in her studio and through retreats across the globe. Charlotte started her journey with us as a young yogini and volunteer in 2012, a six month experience which quite literally changed her life. Her time away from her ´life´ had taught her that she wasn’t defined by a place, a job, or her things, and that she always had a choice. Yoga became her compass, an internal light which when strong will shine through. And so Charlotte came back to Fuerteventura and to the Azulfit family in 2016, to lead our beautiful team as our General Manager and Yoga teacher. She sees her job as quite simple; to help to make the Azulfit dream a reality- creating an environment in which our team and our guests can meet their greatest potential. Through care, support, positivity and passion inside and outside of the studio we can grow and thrive, and find the inner peace and happiness that is our true nature. Crescent-shaped Santorini is considered the precious gem of the Aegean. With its white-washed clifftop villages set against the deep blue sky, multicoloured beaches, vast volcanic vineyards, crystal clear waters and world famous sunsets, it is easy to fall under the spell of this magical, mythical island. You can even scuba dive in this giant lagoon, to adventure into the crater and discover for yourself what’s left of the opening of the volcano. Your retreat home of Oia is located high up on what is considered the balcony of Santorini. Oia is known for its amazing views of the volcano. Just two kilometers from the beach with inspiring walks and views all around, this is a chance to truly unwind and explore the many facets of beautiful Santorini. The culture, architecture, geography and gastromony of Santorini are all reasons to visit in themselves. You can head down to the crystaline coast to take a cooling dip in the deep blue waters and enjoy the stunning beaches with white, red or black sand, spectacular rock formations and impressive lunar landscapes. Stroll through traditional villages, with narrow streets leading you on an adventure through time gone by. Treat your taste buds to the tantalising local food, with a whole host of delicious products to sample – some of it coming straight to your table from the organic garden of your Greek host, Antonis. It doesn’t get much more authentic than this. Daily breakfasts will be served after the morning session. 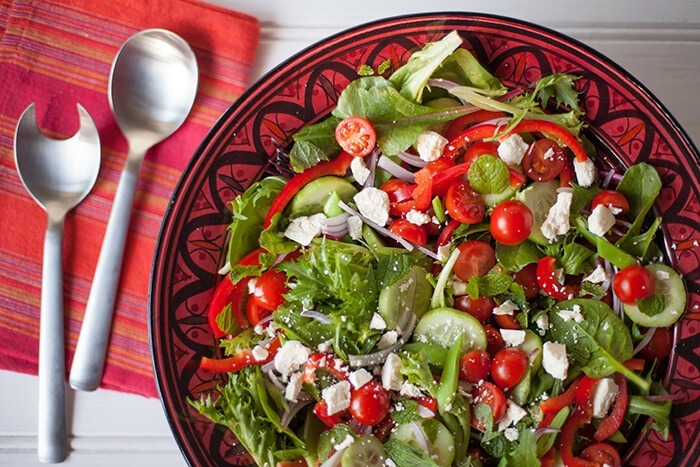 Healthy organic evening meals are included and are grown from the retreat centre's garden. They are vegetarian multi course meals, with starters and a main course. Fish will also feature on the menu two nights, and vegetarian options will be provided each night. Lunch is available for an additional cost at the retreat centre restaurant, or you can explore the nearby village during your down time. Massages can be booked for you to take place at the retreat centre. Please contact us for more information. Price for our Santorini retreat: The cost of the course is 1075 euros per person for a shared room and 1325 euros per person for a private room. Triple rooms and Quad rooms are also available. Back to speciality retreats menu. Andrea’s teaching is second to none! Andrea has so much energy, she pushes you further than you would have thought you could ever go!